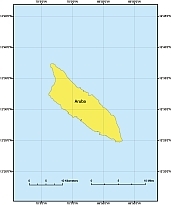 Editable royalty-free map of Aruba in vector-graphic online store. Largest City: Oranjestad (20,046, 1991 est. Aruba is a Caribbean island about the size of Washington, D.C located 15 mi (25 km) north of the coast of Venezuela and 42 mi (68 km) northwest of Curaçao, the largest island of the Netherlands Antilles. Aruba’s terrain is mostly flat with a few hills. There is little in the way of vegetation or outstanding physical features and no inland water. Aruba’s best-known geographical feature is its white-sand beaches, which are the basis of an active tourism industry that is the mainstay of the island’s economy. Aruba is situated on the Caribbean Tectonic Plate.The island is made up of limestone-capped hills and ridges, with cliffs on the northern and northeastern coasts and coral reefs on the southern coast. Aruba has no inland waterways. The Coast and Beaches Aruba has three deepwater harbors located at Oranjestad, Barcadera, and San Nicolas (Sint Nicolaas). The coastal area is known for its white-sand beaches and the calm waters surrounding Aruba are clear, making it a popular tourist destination. Aruba’s tropical marine climate varies little seasonally, with an average annual temperature of 81°F (27°C), varying from about 78°F (26°C) in January to 84°F (29°C) in July. occurs between October and December. cactus species can survive, and there is no arable land.